Chile and Colombia announced Thursday that they have agreed to start negotiations toward a free trade accord, and said they have settled a controversy over exports of Colombian sugar to Chile. The agreements were announced after a meeting between Foreign Minister Alejandro Foxley and visiting Colombian Trade Minister Jorge Botero. Chile agreed to allow 6,000 tons of Colombian sugar and 15,000 tons of sugar-related products to be imported free of duties starting Jan. 1, according to a communiqué issued after the meeting. At the same time, Colombia agreed to immediately lift punitive customs duties of up to 35 percent that it had imposed on the import of automobiles from Chile and duties ranging from 10 to 15 percent on other Chilean products, including wine, pears, apples, grapes and cigarettes. The dispute "was affecting trade relations between the two governments," the communiqué added. The communiqué did not disclose a date for the start of negotiations for a free trade area, but Botero said the governments expect the talks to progress quickly. It would cover products, services and investments. 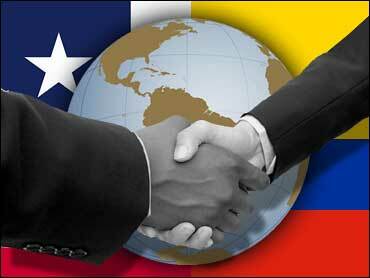 Bilateral trade last year totaled $680 million, with a $4 million surplus for Colombia. Chile already has free trade accords with the United States, the European Union, China, South Korea, among others, and is negotiating with Japan, India and Singapore. Colombia has trade agreements with most of Latin America and it is waiting for final signing of a recently agreed-upon free trade pact with the United States.